The pet industry has become a booming $70B industry – and it’s growing fast. Employment in the sector grew by well over 90% from 2005 through 2015. The pet industry grew from $48B in 2010 to $70B in 2017, and is expected to grow to $117B by 2021. This is attributed to its growing market, the rise of pet spending and the humanization of dogs. “The pet industry is booming,” writes JJ Kinahan, chief strategist at TD Ameritrade, in an email. We spend as much on our pets’ care as we do on our own – or on our kids. Pets are taking on the role of children for many Americans, says Patrick Watson, senior editor at Mauldin Economics. This is particularly true for millennials, who are delaying marriage and having fewer kids. As pet owners increasingly humanize their pets, “they’re more willing to spend money on things like premium pet care and food products,” Kinahan says.Investors large and small recognize this. Between 2012 and 2016, venture capitalists invested nearly $500 million in pet technology alone, according to CB Insights. According to the American Pet Products Association, U.S. pet owners hit an all-time high in 2017 by spending $69.51 B on their pets. Growth in this sector, not surprisingly, has coincided with a significant national increase in what Americans spend on their pets. Pet parents are increasingly treating their pets as a member of their family, with 80% reporting they treat their pets like their children, 60% celebrate their pets’ birthdays, and 46% reporting buying clothing or fashion accessories for their pet. Because dogs are becoming more of an integral member of a family unit, pet parents want to purchase the best products and services for their pup. This was proven by the 5.7% decrease in value dog food brands and the increase in premium brands by 9% between 2012-2015. When it comes to pet services, more pet parents choose luxury options not only to alleviate their busy schedule, but for the benefit to their dog. 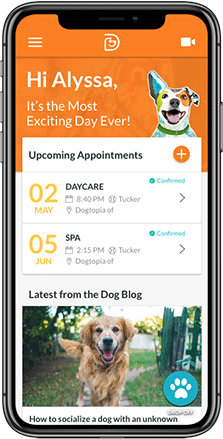 Due to the increased humanization of pets, the pet service industry alone is expected to grow 7% by 2021. 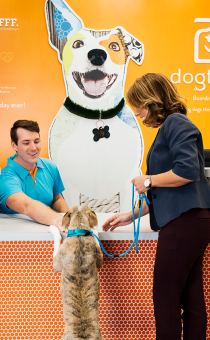 According to the U.S. Bureau of Labor Statistics, the growing demand for pet care services, including dog trainers, groomers, pet sitters, kennel attendants, and caretakers in shelters and rescue leagues, is expected to continue going forward. 70% of all pet owners in the U.S. own at least one dog. People are more likely to own a dog when they are not raising children, which is why millennials and aging baby boomers are the highest demographic of pet owners. 75% of people within each demographic own a pet and this number continues to rise. This increase is due to the inherent increased aging in baby boomers and the delayed age millennials are beginning to have children. Furthermore, pet parents are looking for more than just the norm. 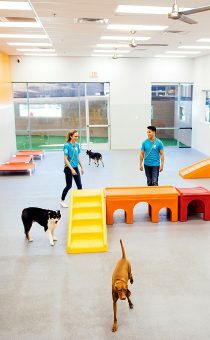 They are looking for a place to socialize, exercise and educate their dogs – not just dog walkers and sitters. Dogs are naturally social animals and as the humanization of the dog continues, pet parents are realizing the need to raise well-behaved and healthy pups through these important facets of pet parenthood, very similar to a child attending school. According to Forbes, an astounding 92% of pet owners spent the same or more on their pets during the most recent recession period. During economic downturns, some industries often feel the pinch, but the pet industry is not one of them. While consumer spending decreased 3% overall during the last recession, spending on pets continued to increase at a 5% annual rate. Many pet parents are more willing to cut costs and eliminate little luxuries elsewhere in their lives before spending less on their beloved furry family members. Pet owners aren’t going to stop spending on their pets just because money is tight. 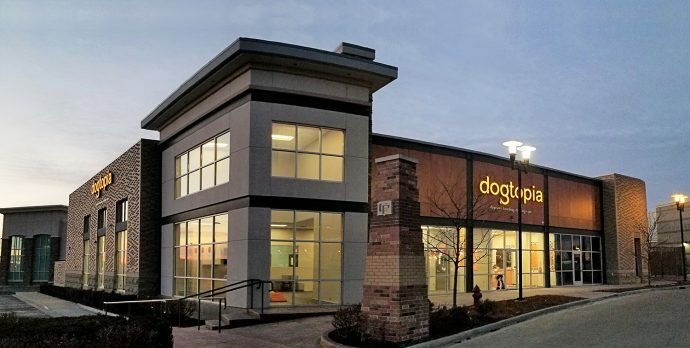 They don’t view these costs as “discretionary spending,” and “are willing to give up other expenses to cater to their pets,” says Jodi Burrows, vice president of SDR Ventures, which has provided advisory and private capital formation services to the pet industry. “This translates to an industry that will continue to do well even if the economy weakens,” Watson says. The industry isn’t immune to market pullbacks, but downturns will be less severe and shorter lived than for other industries, he says.